Anyone from the UK knows the pain of finding products/items and lusting over them, only to find out that they’re available from a shop in the US. Believe me, our tiny little tea-loving hearts break a little bit. 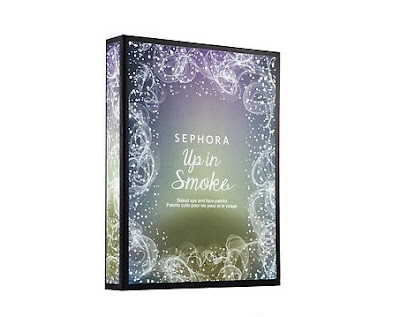 Sephora is one of the stores that I need to visit once in my life, I always find myself scrolling through their new products and favoriting way too many webpages. I know that some of the products stocked in Sephora are available in the UK through department stores, and some online beauty shops. 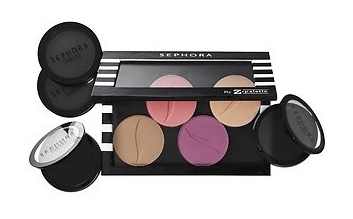 However, the Sephora Collection is an exclusive line of products (obviously) to Sephora. 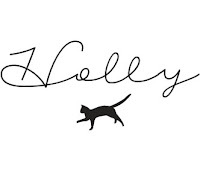 Here are the 10 things in the collection that made me oooh. Rose gold everything? I think so. These limited edition brushes have rose gold handles and a unique rose gold scattered stand – you can’t tell from the picture but it says “The Twinkle of my Eye” which is quite cute, and not too cliché like many slogans seen on beauty products recently. 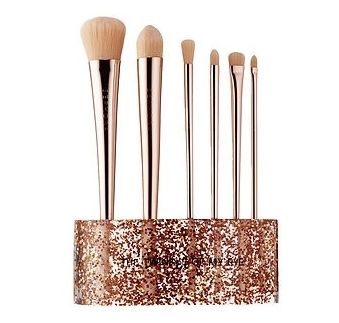 This is definitely a brush set that you would want to display, and it would be suited to anyone’s desk/vanity. It has a little secret though, even the brush bristles are treated with a 24 karat gold infusion process, creating a unique sheen on the bristles – how luxe! 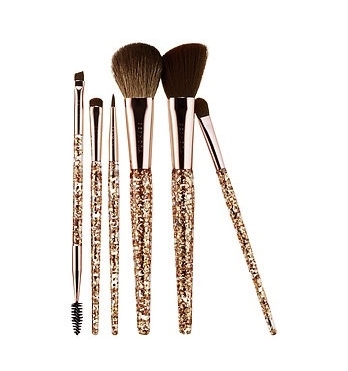 Like the “Glitter Happy” brush set above, the rose gold called to me. Unlike them, however, these have darker bristles and therefore are less likely to stain over time – which I do find really annoying. Plus, I’m all in for the slanted eyebrow duo brush on the far left. I am bit useless when it comes to portable makeup storage, because I can never choose one carry case! I’ve always got a few in mind and can never commit the money, so I just haven’t purchased one. However, this beats all of them. It’s totally waterproof and has labeled Compartments, because whose heart isn’t set aflutter by the thought of organisation? 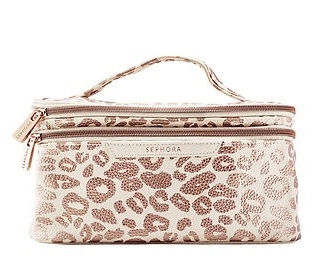 Oh, Rose gold and leopard print – oh you really are treatin’, Sephora. 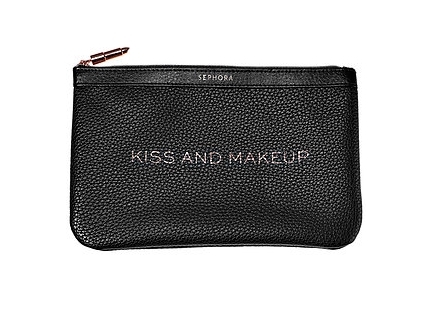 I wouldn’t usually pick this out because I can never find a small makeup bag that will fit all the products that I need. This however, is big enough to be used as a clutch, or in a larger bag as organised make up storage for on-the-go. Plus, did you spot the lipstick-shaped zipper-puller? The one thing that stood out for me about this brush is the shape. What would be better than a contour brush that actually fits into the contours of your face? Imagine the sculpting. 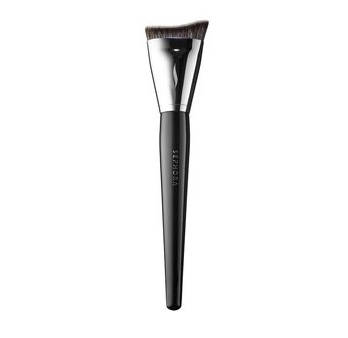 This brush can blend both cream and powder formulas, however I do wonder how well it would do on other areas, other than the hollows of the cheeks. When it comes to matte lipsticks I just can’t get enough, and this lip stain is no exception. It dries completely matte. 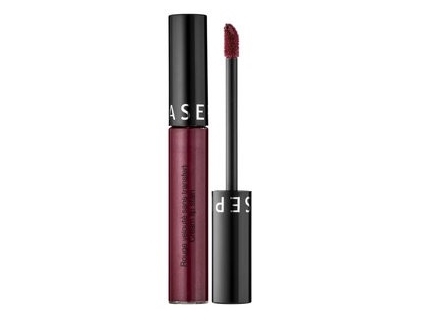 I chose this deep plum colour, perfect for a AW15 party lip that lasts all night, baby. I am being such a sucker for packaging with this one, metallic and snake print is a winner for me. The reviews on this product are mixed and many claim that there is a ridiculous amount of fall out in the pans, but come on look at the packaging. 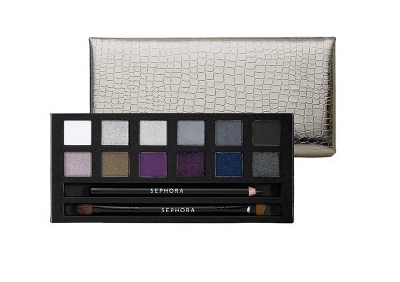 I would probably only end up using 6/12 shades in this palette, and I couldn’t justify buying it. But the casing gets a A+ from me, so it’s worth a mention. 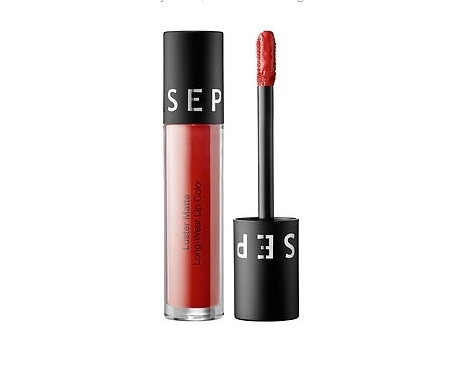 As a red lip enthusiast, I have so many bright red matte colours – yet this one is a little bit different. It contains a hint of shimmer blended through the formula, yet dries with full matte coverage. I need this in my collection, pronto! 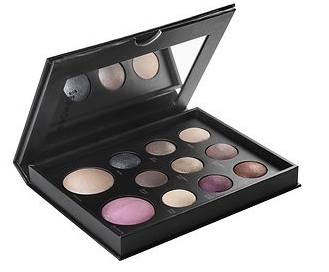 Here you can create your own face palette with 4 powder shades out of a possible 23 shades in the collection. They have a really impressive range of colours, all to be used as you wish – as bronzer, contour, blush or highlight. I personally would choose one of each to create a custom look, but you could also choose all of one category to have a custom blush palette, for example. I am completely obsessed with baked products after being won over by the Milani Baked Blushes, so I would definitely give these eyeshadows a try. All of the colours are really wearable, and I’m of course I’m drawn to the ones with “copper”,”gold”, and “bronze” in the shade names. Surprisingly enough, the glorious royal purple colour, Purple Smoke, has me very curious indeed. What “wow” items are you lusting over?